R.I.P. Pippi, 2005?-2015 Sadly, Pippi succumbed to stomach cancer in December, 2015. But she was such an important part of this blog and its narrative, that I’m leaving this page and keeping it all in present tense. Let it stand as her memorial, and may her memory be a blessing. 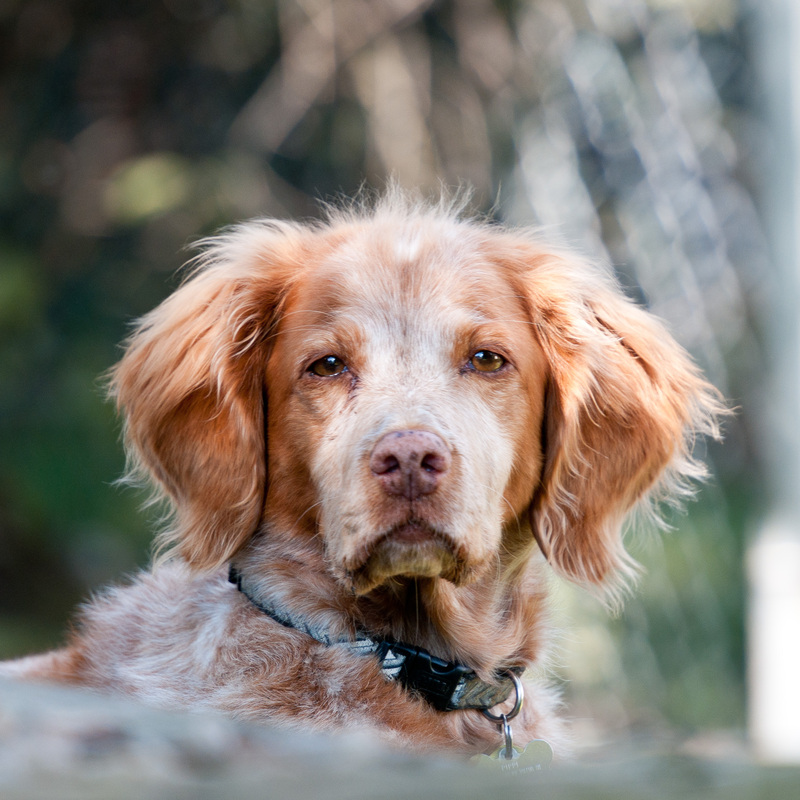 Pippi the Brittany is more than just a dog. Pippi has more personality, more moods, and more schemes in her head (usually involving vanquishing squirrels) than any other companion creature I’ve known. I swear, we keep expecting her to open her mouth and start talking one of these days, and we won’t be in the least surprised if that happens. But maybe that’s because she’s *our* dog and we’re ridiculously attached to her. And since we don’t have kids, she’s our family. She’s who we fuss over and worry about. We take her home at the holidays (Bullock’s mother has a picture of her on her Christmas tree along with the actual grandchildren) and we feel bad when we go places we can’t take her. She also happens to be the most photogenic resident of this household, so she makes frequent appearances on this blog. Pippi is also a poster child for rescue dogs. She’s about as well-adjusted and trainable a dog you’d ever want, and yet we didn’t have her until she was fully grown, and we have no idea what her past was. We adopted her in March, 2008, from National Brittany Rescue and Adoption Network, when she was about two years old. For the previous two months, she’d been living with foster parents volunteering for NBRAN, after she was found as a stray — a matted, bedraggled stray — in another part of the state. Who knows what her history was before then. We actually wanted another dog at first, but were rejected as potential adopters for that dog (we were noobs and that dog was a little more high-maintenance — I can kind of understand). I was heartbroken, but then Pippi appeared on the website, under the temporary name Rowan. From the minute I saw her thoughtful, freckled face, I fell in love. (You can read about that process, including the other names we considered, and see early pictures of her with her hair shaved down here and here.) Pippi’s been a part of our pack ever since. I happened to stumble across this site and thanks to you we’ve discovered that our beloved James is probably a Brittany. The resemblance between him and your Pippi is just striking! We rescued James about half a year ago from a family who was going through a divorce and needed to get rid of him, but they had no idea what breed he was (they assumed a retriever mix, but his personality is nothing like it). So, thank you so much for sharing your wonderful photo’s and enlightening us on the background of our family member! Glad I could help, Cindy, however accidentally! If he looks like Pippi then he’s got a “roan” coat — one where the orange (or liver) and white are blended, rather than orange/liver spots on a clear white coat. Do a google image search for “Britanny dog” and you’ll get more pictures to compare. Add “roan” to the search and you’ll get some roanies in a range of orange and liver roan coat patterns (though the clear coated Brittanies still show up, too). Positively fascinating 🙂 his puppy pictures are identical to some images on Google. No wonder he loves nothing more in the whole wide world than to chase birds on the beach… Might be he’s still a mix though, since he seems to be somewhat larger than most dogs on the images. His hair is also a bit longer and curlier than most Brittany dogs we’ve seen in the past, which is why we always thought he was some kind of bizarre Irish setter / Spaniel mix. He might be part Springer Spaniel. They have curlier hair (though I’ve met some Brittanies with curly-ish hair and the roans seem to have a different textured hair than the clear-coated Brits). Also, I can’t tell a Springer puppy from a Brittany one, since their feathering doesn’t grow in until they’re a year or more older. As for size, Pippi is a big Brit — she’s 40 pounds — and the dogs bred mostly for the field rather than the show ring are often bigger than the standard (though technically Brits are supposed to be “dual” dogs — show and field — and have a single standard). Anyway, I would love to see the pictures — looking forward to them!